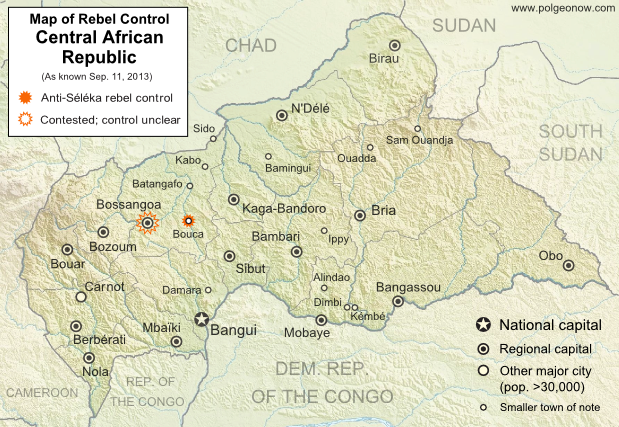 Starting last December, a rebel coalition called Séléka swept across the Central African Republic from the north, capturing much of the country by January (see our first map of rebel control in the CAR). After a short-lived attempt at peace, Séléka renewed its campaign, capturing the capital and forcing President François Bozizé to flee the country. Rebel leader Michel Djotodia declared himself president, and Séléka has remained the major power in the country despite outbreaks of violence and general chaos. Djotodia consolidated his power with an official presidential inauguration last month, but the conflict has proven to be far from settled. This Monday, heavy fighting broke out near Bossangoa, a city in the northwest, with anti-Séléka rebels reportedly taking over six unspecified towns in the area. Djotodia's government said Bouca was one of the captured towns, while blaming the uprising on supporters of former president Bozizé. The area is indeed Bozizé's home region, though the rebels may not all be his supporters. A newspaper from Ghana reported that the rebels called themselves Anti-Balaka, which it translated as "Anti-Machete". The same report also indicated that Bossangoa itself had fallen under rebel control, though other sources only state that fighting is ongoing in the surrounding villages as the city is being abandoned by fleeing civilians. Stay tuned to Political Geography Now's Central African Republic channel for updated maps of this evolving situation! Graphic of the flag of the Central African Republic is in the public domain (source).